Dr. Sami Khanal is an Assistant Professor of Agricultural Sensing for Sustainability Indicators in the Department of Food, Agricultural and Biological Engineering at The Ohio State University. She specializes in the application of remote sensing technologies, geographic information system (GIS), big data analytics and ecosystem modeling in support of landscape scale research on agricultural and forest health, assessment of climate change impact on biomass production and water quality, assessment of crop nutrient stress and occurrence, and food security. 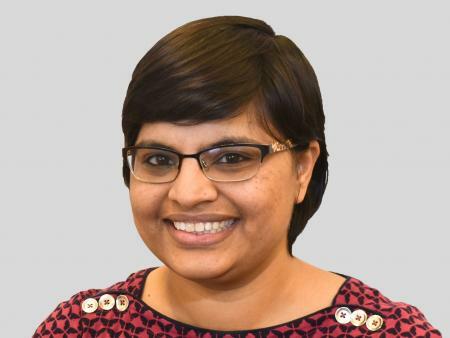 Khanal earned her Ph.D. degree in ‘Environment and Resources’, with a focus on sustainability assessment of agricultural systems, from the University of Wisconsin-Madison; a M.S. degree in ‘Geosciences’, with a focus on geographic information systems (GIS) and remote sensing, from Mississippi State University; and a B.S. in ‘Information Management’, with focus on computer science and information management, from Tribhuvan University in Nepal. My research is focused on developing tools and techniques for integrating data obtained from a variety of sources (e.g., field, drone, manned-aircraft, and satellite) at field and landscape scales to assess crop and soil health, and their functioning. By combining high- resolution spatial and temporal data obtained using remote sensing technologies with ecosystem process models, I infer the effects of climate and land use practices on the functioning of agricultural and forest landscapes. The overarching goal of my research program is to contribute towards the design and development of sustainable landscapes in which producers optimize their lands for food and feedstock production while managing resources to preserve natural ecosystems and mitigate environmental problems under changing climate, growing population, and socio-economic conditions. 2. What initially got you interested in agricultural sensing? I am originally from Nepal, where two-thirds of the population rely on subsistence farming. I have thus closely witnessed the importance of agricultural management and monitoring in achieving food security, alleviating poverty, and improving society’s standards of living. At the same time, in a global perspective, there is unprecedented demand to produce more food, feed, fiber and renewable fuel of higher quality, and in a more sustainable manner to support population growth, rapid urbanization, changing diet and economic development. These issues intrigued me toward exploring and leveraging data-driven technologies in improving agricultural production in a sustainable manner. Data-driven technologies are some of the approaches that help select rightmanagementpracticeattherightrateattherighttimeintherightplace,thereby helping to improve both agricultural productivity and environmental health. Over the past 15 years, I have been involved with different projects related to these issues, and have realized that the integration of data and data analytic techniques can be a promising step forward to improve productivity, profitability and sustainability of agricultural practices. One of the main factors that drew me to the Department of Food, Agricultural and Biological Engineering at The Ohio State University is the interdisciplinary nature of the research and teaching activities that are taking place within the department and university as a whole. The FABE faculty and students are working on a wide range of important topics, such as digital agriculture, water quality mitigation in agricultural systems, precision livestock, hydroponics, soil drainage, food processing and treatment, natural rubber, waste management, biofuels, and systems modeling and analysis, to name a few. My prior and current research activities and interest in remote sensing, GIS and big data analytics place me in a unique position to both collaborate with other FABE faculty on these different areas, and establish my own program. I look forward to working closely with researchers from various disciplines (e.g., computer science, agricultural, mechanical and electrical engineering, economics, horticulture and crop sciences, environment and natural resources, and sustainable engineering), farmers, and industries to identify tipping point questions and develop tools that support the design and development of sustainable and productive landscapes. I am equally excited for the opportunity to develop and teach courses in the cutting-edge field of digital agriculture, as well as advising and training graduate and undergraduate students in these topics. I have two main goals for the future. The first is to develop user-friendly decision support tools that will allow stakeholders, including farmers, researchers, environmentalists and policymakers, to evaluate the tradeoffs of alternative land management practices and help them to select sustainable land use practices. My second goal is to offer enhanced educational opportunities that incorporate real-world case studies and hands-on training, to prepare students to become future leaders in academia and industry.